Back in January I briefly talked about photo backups and linked to a Pixiq article. I recently read another good photo backup article and wanted to share it with you. The author talks about the various ways to back up your photo collection (summary: DVD=no, hard drives=yes, have at least 3 copies) and what format to archive them in. He briefly touched on "digital asset management" (DAM) which is basically a fancy way of saying "cataloging". I found it interesting that he never mentioned any of the online backup services. The first article I mentioned talks about online backups. I don't use any of those, mostly because I'm cheap but also because I like to have control over my own files. As I mentioned in my previous post, I do have 3 copies... my desktop, my home media server, and an offsite drive. I also read a good review of Drobo. Drobo is a storage appliance, a smart box that you plug hard drives into and use like an external hard drive. What's great about the Drobo is that it handles redundancy transparently, so a drive can fail and it will alert you but continue working. Replace the failed drive in the Drobo unit (without powering off) and Drobo automatically uses it and makes things redundant again. Not enough space? Replace a drive at a time and Drobo will use them, all with no downtime. 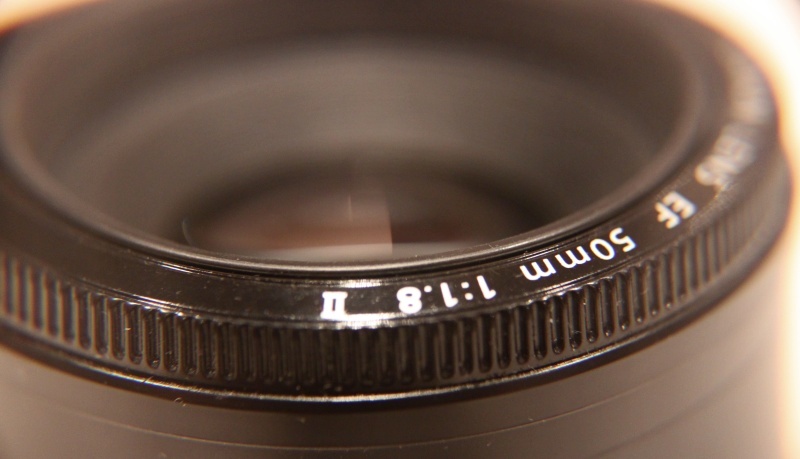 PS - that's my 50mm lens in the photo above.. playing with macro photography. I have a long way to go!